Baby Aster are members of the Sunflower Family. The plant grows to 6 inches in height and has greyish-green, linear, finely haired leaves that grow along the entire stem to 0.25 inches in length. The plant typically grows on dry slopes and mesas at elevations between 3500-7000 feet. 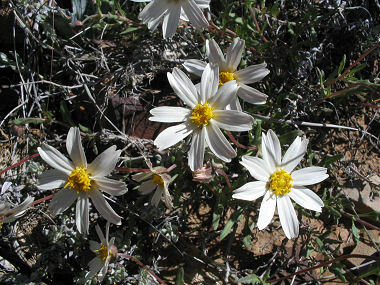 Baby Aster is also known as White Aster. Baby Asters bloom between March - September and produces white, ray flowers with yellow central disks that form at the end of the plant's stalks.